It was recently announced that Sage Inventory Advisor Basics is now included with select Sage 300c bundles at no additional cost. Read on to learn about this enhancement to Sage 300c and what it means for inventory management. In short, it’s a light version of the product that focuses on the most common inventory challenges while removing some of the complexity of more advanced functionality in Sage Inventory Advisor that not every company needs or uses. At the same time, it makes the product easier to implement, understand, and start benefiting from right away. How is It Different Than the Core Inventory Module? The core inventory functionality in Sage 300c is focused on processing and managing transactions. 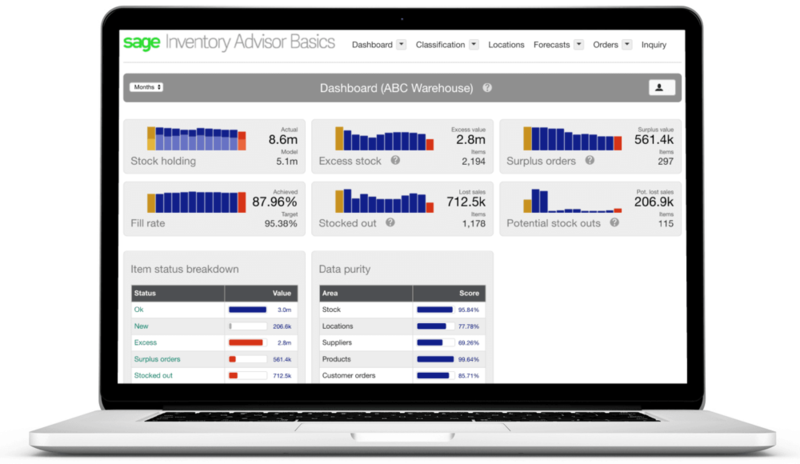 From there, Sage Inventory Advisor Basics then leverages that transactional data to help you make more informed decisions about how much inventory to stock, when to buy more, and many other strategic insights that the core inventory functionality isn’t capable of. In short, they complement each other. Who Gets Sage Inventory Advisor Basics? The Sage 300c Essentials bundle – typically made up of “Financials Only” customers – is excluded. In addition, customers running Sage 300c Advanced or Complete must be on a current Gold or Platinum level Business Care Plan. Customers on Silver level plans will not receive the free Sage Inventory Advisor Basics product. Contact us with your questions about Sage 300c and Sage Inventory Advisor Basics.